Samuel Hartharn-EvansHaving harboured a passion for both music and marine science, a Bangor University student has graduated with pride, scooping up prizes and accolades along the way. Samuel Hartharn-Evans, 21, from Bebington, Wirral has not only graduated with a first-class BSc Marine Biology & Oceanography degree, but has also won the Dr John Robert Jones Prize of £600, which is awarded annually to the best students across all disciplines at the University. An outstanding student in many respects, Sam came to Bangor University on a Mathematics Entrance Scholarship. Sam has excelled since day one, winning the Ray Delahunty Memorial Prize for the best first year ocean sciences student, and on graduation he has been awarded the Darbyshire Prize as the highest scoring oceanography student. His dissertation has been nominated by the School of Ocean Sciences for the 2018 UK Challenger Society for Marine Science prize for the best undergraduate marine science dissertation in the UK. Showing great promise as a researcher, after his second year, Sam undertook a voluntary summer internship with Dr Mattias Green and Dr Gareth Williams. He worked through datasets and coding from temperature loggers dotted around US-owned islands around the tropical Pacific, feeding into projects looking at how physical conditions affect coral reefs around the islands. Sam’s dissertation covered the impact of the (proposed) redirection of the Siberian Rivers on the oceanography of the Arctic Ocean and the potential knock-on effects on Northern Hemisphere weather patterns. Again, this was a strongly numerical project which involved developing a numerical model from scratch. His dissertation is currently being prepared for publication. 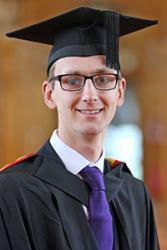 Away from the classroom, Sam has been very involved in music at Bangor University. As well as being the principle Trombonist in the University Symphony Orchestra, experiencing playing alongside the BBC National Orchestra of Wales and the Hoosiers, he has also served as both treasurer and chairperson of the University Brass Band. Like so many Bangor students, Sam is also interested in the outdoors and in particular scuba diving, gaining a number of qualifications whilst at University. Sam has excelled as a peer guide shepherding and mentoring incoming students, as well as representing the student face of the School of Ocean Sciences to visitors during the University open days. About his student experience, Sam said: “Bangor is one of the best places in the world to study Ocean Sciences. On top of that, its wonderful surroundings offers the ability to go and explore an exceptional environment. In addition, the choice of over 150 free clubs and societies was a major draw as a trombone player who wanted to get involved in University music, something I’ve certainly done during my time here. “Between my second and third year, I ran a bid to host UniBrass, the University Brass Band Championships of Great Britain and Northern Ireland in Bangor, a bid which proved successful and I’m now chair of the UniBrass Organising Committee. This event hopes to bring hundreds of students from across the UK together in Bangor to take part in a day of top quality music making, whilst involving the local community and young people to increase participation of young people in the brass banding movement.